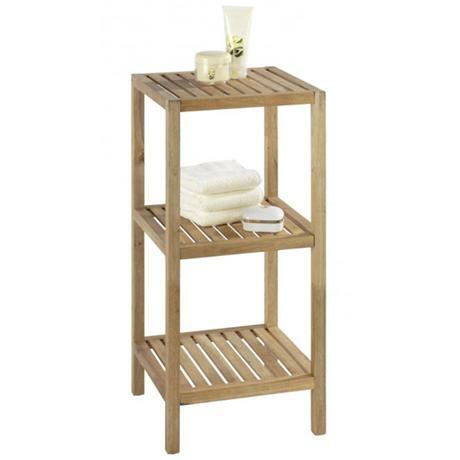 The practical Norway 3 Tier Bathroom Shelf from Wenko is a must have item for any bathroom. Made from natural oil finished walnut wood, improve your bathroom with this practical storage solution. It's truely a beautifully designed piece of bathroom furniture. Made of natural oil finished walnut wood. Prompt delivery. At under £30 this unit it's an absolute steal. The solid wood is sturdy and weighty with complimentary rubber floor protectors. Had it assemble in 10 minutes by myself and it looks amazingly spa like in our little bathroom.Would definitely recommend. It's a very high quality product exactly as advertised. Couldn't be more pleased with it.